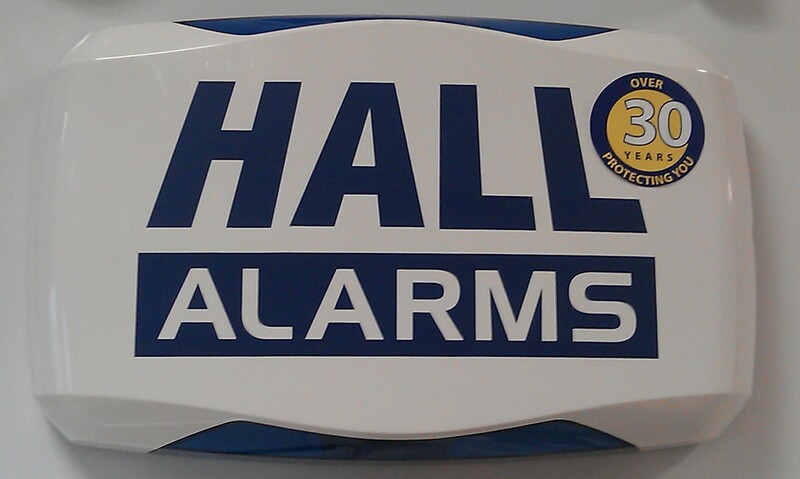 Contact Hall Alarms Ltd today to discuss any queries you might have with your CCTV Systems. (052) 6121944. Farmers have unwittingly left themselves open to massive security and privacy threats with their CCTV security cameras. 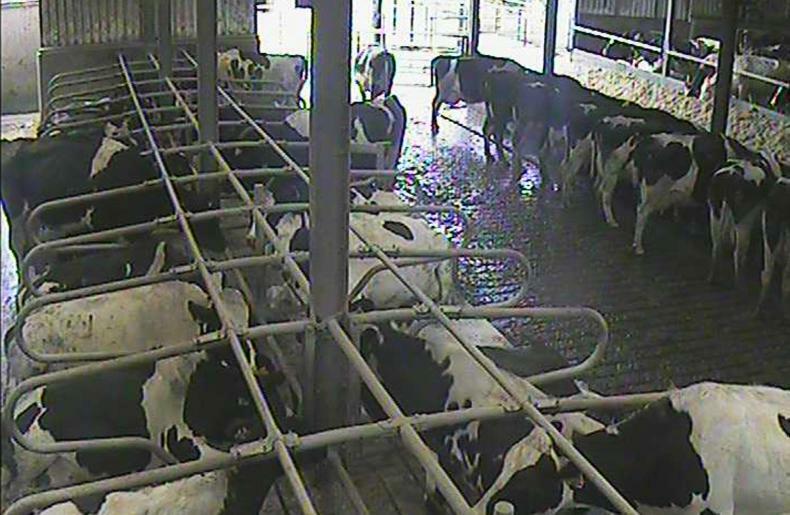 Farmers across Ireland who use web-based CCTV cameras to monitor their farms have unwittingly left themselves open to a massive security and privacy threat by not changing the default passwords on their cameras. Footage from farm sheds, yards and homes from Cork to Donegal is being streamed live by an international website to anyone who logs on. The website, Insecam.org, is described as the world’s biggest directory of online surveillance security cameras. 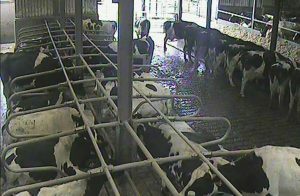 Two cameras located in the cubicle shed of a large dairy herd near Youghal in Co Cork, with the feeding loader clearly visible parked in the passageway. A freshly calved Simmental suckler cow with her calf in Drogheda, Co Louth, along with calves in a neighbouring pen. A Friesian cow isolated in a calving pen in Castlebar, Co Mayo. The front door of a house in Belturbet, Co Mayo. A Charolais cow and her calf bedded on straw in Tullamore, Co Offaly. The altar and sacristy door of a church in Longford town. A feed store with a large bag of meal in Cork placed on a pallet behind a galvanised sheeted gate. Directly underneath each video stream, there is an interactive Google map which shows the location of the internet service provider (ISP) linked to the camera, the address including town, region and country, as well as the longitude and latitude co-ordinates. The website allows anyone to search for footage by country and by various headings including farm, animal, warehouse, religious, home, interesting and warehouse. The footage from Ireland comes from multiple camera brands, including Vivotek, Foscam, Axis, Defaway, Bosch, Mobotix, Linksys, Panasonic, Sony. According to the website, none of the cameras listed are hacked – they simply do not have any password protection. 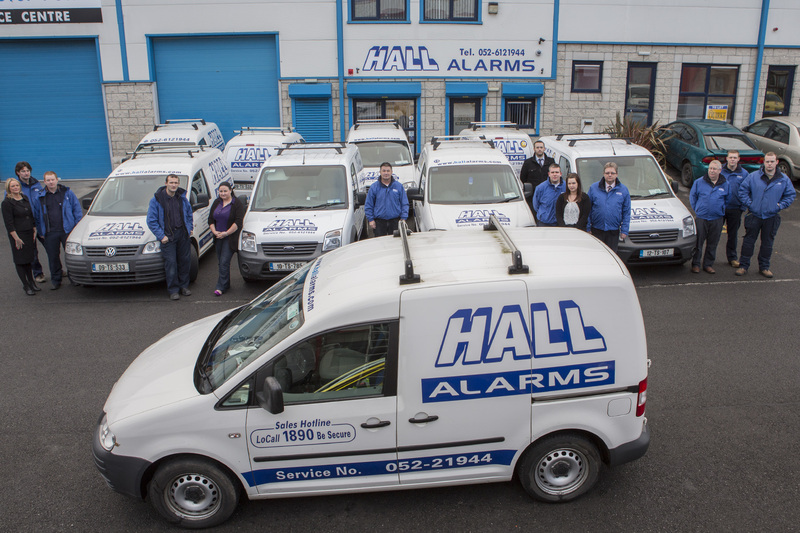 We are currently seeking applications for the position of Electronic Security Systems Engineer, based in our Clonmel office. 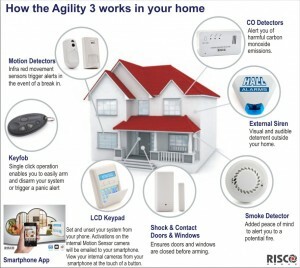 This system is a great option for those who want the added functionality of a smart phone application for their alarm. Agility 3 also supports visual verification with a self monitoring Smartphone app (also available via web browser) which enables homeowners to control their alarm systems remotely as well as view real-time images taken inside their premises with the eyeWave™ wireless PIR camera detector which communicates with the RISCO Cloud server. 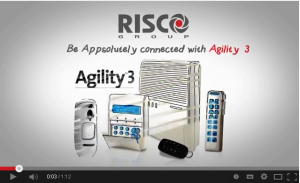 Check out this short video about the features of the Risco Agility 3. 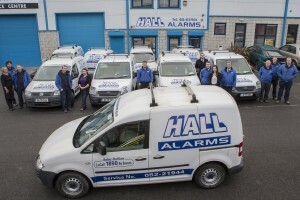 Hall Alarms currently have a vacancy for a Security Systems Service Engineer. This is a fixed term 6 month contract. Experience in the industry is a must. Full clean driving licence required. The winner of our Sticker Hunt Competition is Anthony Bates from Clonmel. Congratulations to Anthony and his partner Nikita. Anthony solved the Clonmel clues for Kevin O’ Learys, Showgrounds Shopping Centre and Carphone Warehouse and snapped the special anniversary stickers. The answers to the other town’s clues are as follows. 1. You’ll get your “fill” in this “station” on the Limerick Road. And “Swift” service too! 2. Have a nice pint with “Nellie” on Main Street. 3. Great “Credit” is due to this financial institute for it’s excellent service! Pierse Swift Service Station, Nellie O’ Briens and Tipperary Credit Union. SG Cinemas, Lannigan & Curran Solicitors and Oceanna Day Spa. Thanks to all of those who entered this competition. 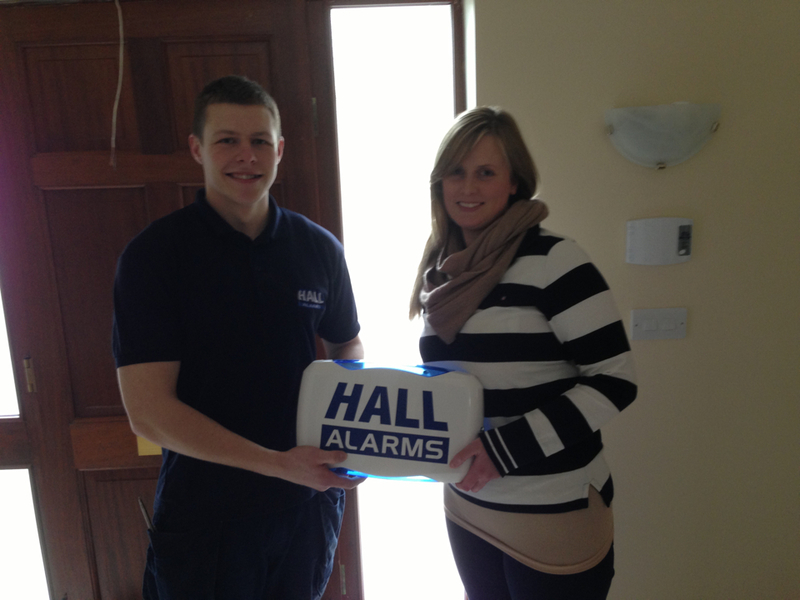 We still have one more alarm system to give away to celebrate our anniversary so stay tuned for details of how to enter this competition. Each Monday for the next few weeks we will be giving out clues on Facebook/ Twitter and here on the news page for a different town. Pick whichever town is closest to you. These clues will lead you to 3 different businesses in that town. Each of these premises will have a special sticker placed on their bell box (see picture). What you need to do is solve these clues and take a picture of each of these bell boxes and email the three pictures to info@hallalarms.com or upload them to our facebook or twitter. All entrants will be entered into a draw to win this fabulous prize. We will be accepting entries from all towns until the end of the competition. 1. This complex is a “ground” that puts on a good “show”….you’ll really enjoy the shopping here! 2. The Irish equivalent of “Vauxhall”, …this “Kevin” is located on the town side of the field of poppies. 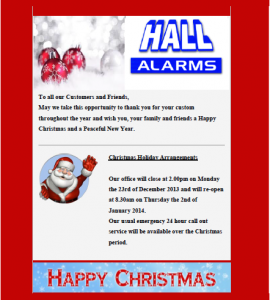 Seasons Greetings to all of our customers and friends. We would like to take this opportunity to thank you all for your support during 2012. Please see our holiday arrangements. 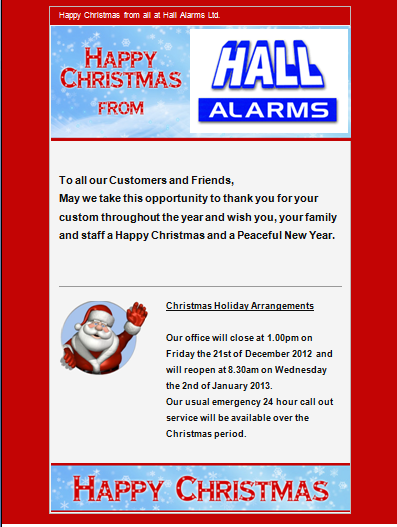 Our offices will close on Friday 21st December 2012 and reopen on Wednesday 2nd January 2013. If you need us in the meantime, our usual 24 Hour service is available to our customers all throughout the Christmas period. Wishing you all a safe and happy festive season! Don’t forget to enter our sticker hunt competition over the Holidays to win a free alarm installed in your home.